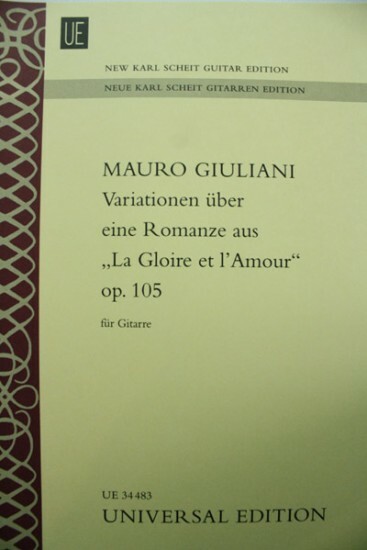 Variationen uber eine Romanze aus "La Glore et l'Amour"
19th-century Italian guitar composer wrote these variations on a popular opera of that time, La Gloire et l’Amour by François-Adrien Boieldieu, which premiered in Paris in 1816. Giuliani is said to have been inspired to compose this variation after attending the Viennese premiere of the opera in 1818. While appearing simple, the Romance theme is preceded by his weighty and almost dramatic short introduction in the key of C minor. For advanced players.